Congressman Lee Zeldin and Senator Chuck Schumer have have re-introduced Mr. Schumer’s long-languishing “Fluke Fairness Bill,” an attempt to reform the current federal fluke fishing regulations that leave New York fishermen at the short end of the catching spectrum. The current system of federal regulations for fluke fishing has created a complicated patchwork of quotas and rules for each state in the Atlantic States region, leading recreational fishermen to travel to neighboring states to fish from charter boats, where the catch limits have historically been higher than in New York. Last year, the Atlantic States Marine Fisheries Commission allowed New York anglers to keep five fluke of 18 inches or more during the 128-day season that starts early May. Before that change, New York anglers could only keep four fluke of 19 inches or above. But fishermen from New Jersey and Connecticut, who fish some of the same waters as New York fishermen, can still keep five fish that are at or above 17.5 inches, and the regulations can change from year to year. The Fluke Fairness Bill is an attempt at a permanent solution to this lingering problem. 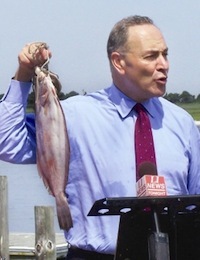 Mr. Schumer has been fighting for fairness for fluke and flounder fishermen since at least 2009. The full text of the house version of the bill (HR 1888) is available online here. It has been referred to the house committee on Natural Resources. According to the Library of Congress, Mr. Schumer’s bill, S.1757, was last referred to the Senate Committee on Commerce, Science and Transportation in November of 2013. If you’re having trouble telling a fluke from a winter flounder, this here video is pretty helpful. Growing up I was told Fluke are lefties and Flounder are righties. We started fishing for Flounder on St Patrick’s Day even if it was snowing. My uncle would take me to George Moore’s boat “The TEX” in Stirling Harbor, Greenport.